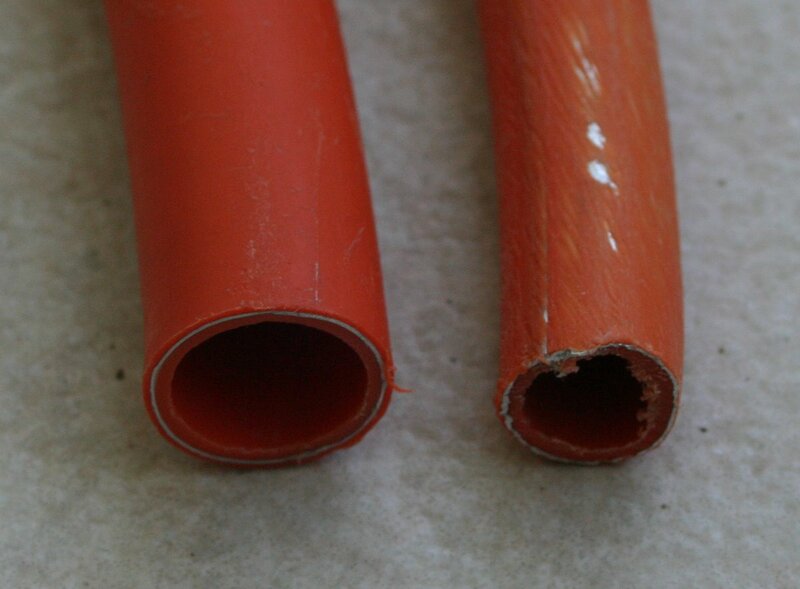 A while back I found another discarded piece of the orange polyethylene-aluminum-polyethylene tubing from which I already built several loop antennas. This piece was small, about 1.5m, and thicker than the tubing I’ve been using so far: the diameter of the aluminum tube is 16mm rather than 14mm. I decided to turn it into a 50MHz (6m) magnetic loop. The main challenge when building magnetic loops is the tuning capacitor. After considering several designs, I decided to build a trombone capacitor using the loop itself as one plate, using 16mm polyethylene-aluminum-polyethylene tubing for the loop and the outer plate of the trombone, and a small piece of the 14mm as the inner plate. This is essentially a refined version of my unusual loop; in the unusual loop I squashed one end of the loop and stuffed it into the other end to form a capacitor. This time I would stuff a thin tubing into both ends of the loop, creating two capacitor that are connected in series by the thin inner tubing. The thin tubing was too thick to slide into the thick tubing, so I had to file some of the outer polyethylene layer from the thin tubing. In the picture at the top, you can see scratches from this process and you can also see that the aluminum got exposed in some places. This is nothing to worry about, because the inner coating of the thick tube is about a millimeter thick, giving plenty of insulation. After filing away some of the polyethylene, the thin loop slid into the thick one. Sizing the loop, sizing the capacitor section (the small piece of thin tubing that slides into the open ends of the thick-tubing loop), and tuning the loop were all difficult, because I don’t have an antenna analyzer. I could sometimes detect the frequency to which the loop was tuned by the peak in the noise, but not always, especially if the resonant frequency was way off. Also, the KI6GD loop calculator that I usually use to size loops and tuning capacitors refuses to go above 30Mhz. I initially started with a loop that was too large, so it resonated way above 50MHz even with no capacitor at all. I then decided to scale down the loop from a 25MHz design; this suggested a 38cm loop, which turned out to be a good size. I made some rough calculations as to how much capacitance each centimeter of the trombone would produce; I did not attempt to measure the capacitance, which perhaps I should have. The capacitor section too started much too long, but after I cut it to about 9cm I was able to tune the loop near 50.1Mhz, which was my goal. Tuning took a long time. Once the loop was tuned, I secured the trombone in place using a lot of electrical tape. It’s been several weeks since, during which I moved the loop many times, and it remained tuned. Even being in the sun does not seem to detune it significantly. 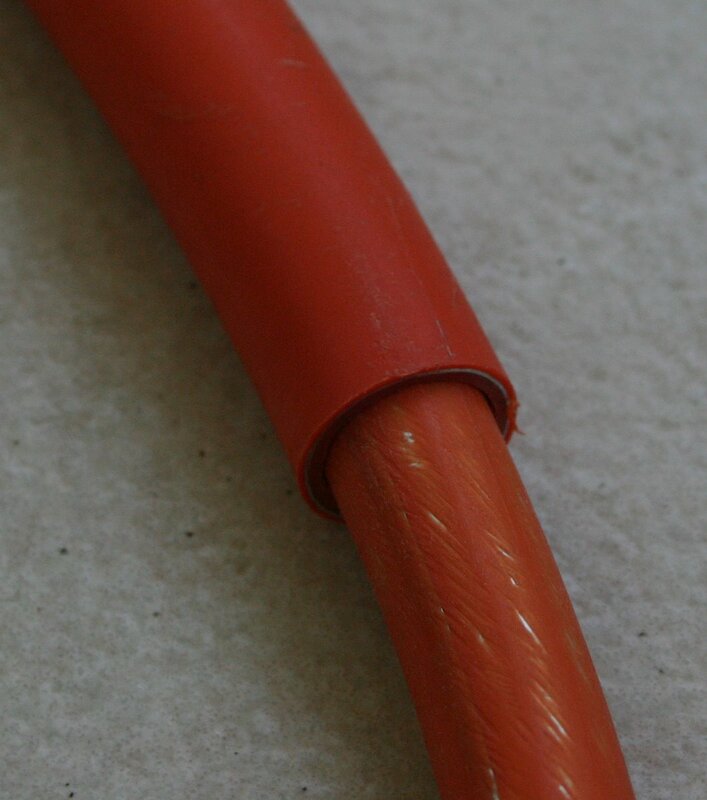 The coax is coupled to the loop 1/5-diameter loop made from stiff copper wire. 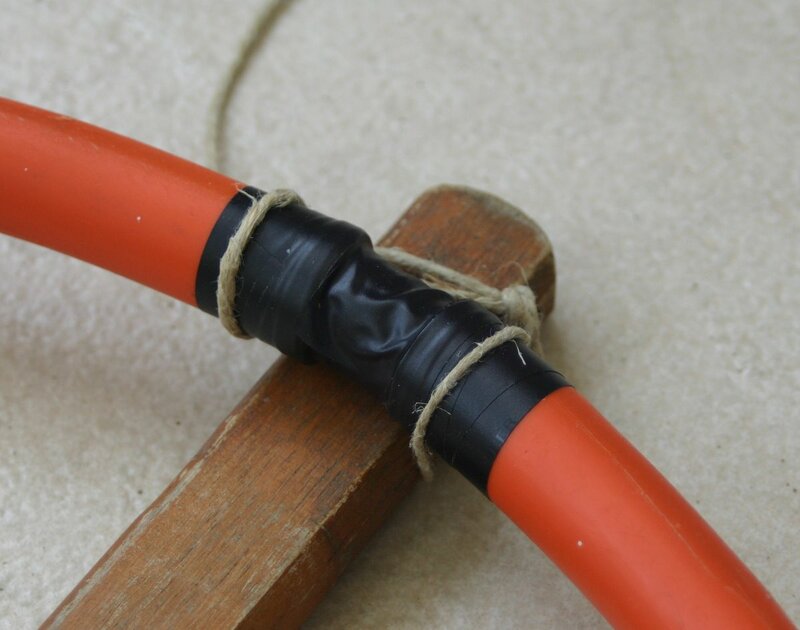 The coax connector and the coupling loop are secured to an ABS base using lots of epoxy glue; the base is secured to the loop using two cable ties. A relatively large magnetic loop that requires very little capacitance to tune has a relatively wide bandwidth. That, together with the fact that the 50MHz allocation here is only 200kHz wide (of which the lower 100kHz is used mostly for beacons), means that a fixed-tune loop is good enough for me. I don’t know how good the capacitor is (how high its Q) and I didn’t measure this, but in theory the Q should be high, because polyethylene is a good dielectric; Peter Rhodes used polyethylene bags (e.g. freezer bags) in his PIC-A-TUNE antenna tuner to build high-Q high voltage capacitors. In practice the coating of my tubes might have some additives that lower the Q, so I can’t say anything definite. I have not found too many other designs for 50MHz loops. Ed Bosshard describes a couple on his web site (both larger than mine). 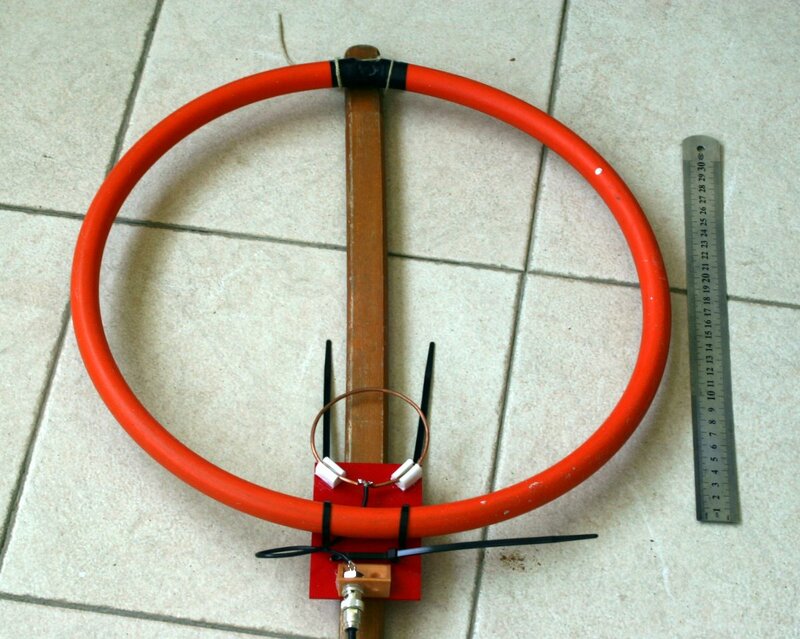 Juan Antonio Siles Sanchez published two videos documenting (in Spanish) the construction of a square copper loop with a trombone capacitor; the loop itself forms the outer tube of the trombone, as in my antenna, and a threaded rod forms the inner part. Higher in the VHF and certainly at UHF, magnetic loops do not make much sense, because the size of half-wavelength antennas and even full-wavelength loops is manageable, even if you do not have a lot of space. 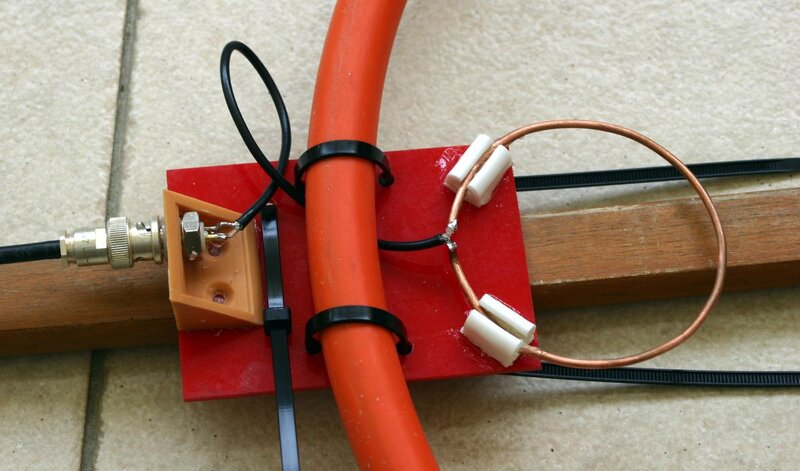 But the 3m that a 50MHz dipole would require may still be large enough to make a magnetic loop attractive. So far I’ve made only local contacts with the loop, but there is no reason that it would not work for long-distance communication when conditions are good enough on the band. Relative to the wavelength, this loop is larger than my coax loop is at 14MHz and 21MHz, bands at which I’ve made many long distant contacts with the coax loop. An update from early June 2011: Yes, the loop works fine for contacts with distant stations. So far I’ve made two SSB contacts with European stations and heard many more in several modes. The loop also seems to stay tuned, which is something I worried about a bit.